Back to School Night serves as one of the most important building blocks for a successful school year. Use this perfect time to capitalize on school spirit for recruiting active parent volunteers, not to mention creating a framework for the year's upcoming school activities, events and fundraisers! Whether it’s elementary school, middle school or high school, the one constant is that there is never enough time. The key to a successful back-to-school night is organization, organization, organization! 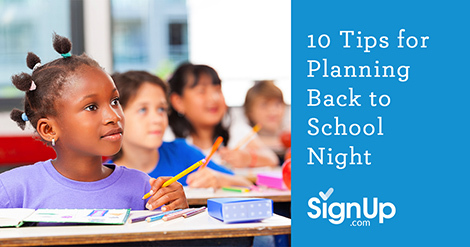 Use these ten tried and true tips for the best Back to School night yet. 1. Make it as easy as possible for parents to attend. Make sure there is clear signage directing parents to parking, and to the classrooms within the school. Draft your student council to stand in the hallways, guiding parents to specific room numbers. If at all possible, offer childcare so that parents can attend without distraction. 2. Make sure you acknowledge your parent leaders by giving them pre-printed or decorated name tags. Ask those who feel comfortable to serve as resources for other parents, and make sure to that new-to-the-school parents know where to direct their questions and concerns. 3. Set expectations in your opening remarks to establish the goals of the evening. Note that teachers will be unable to offer specific remarks about individual children –those will have to wait until parent-teacher conferences a bit later in the semester. Back-to-School night is about introducing the teacher and class to the parents! 4. By having your school calendar of events listed an easily accessible, it allows parents to pick and choose which activities they can participate in, and add those commitments to their calendars. Today’s technology makes that easier than ever. Have all of your school activities SignUps for the year ready to go in one central place on SignUp.com –free of charge! SignUp.com provides calendar syncing and an automated reminder service, AND parents can sign up during Back to School night right from their hand-held mobile devices and smart phones! 5. Have a Club Fair at Back to School Night. Ask representatives of the various school clubs, sports, and extra-curricular activities to set up booths so parents can learn about new school programs, clubs, after-school resources and volunteering opportunities. 6. Don’t forget to connect your parents to each other and the school through social media. Prominently post where and how parents can connect online – i.e. Facebook, Twitter, Instagram and Pinterest. 7. Encourage teachers to provide brochures with an outline of their PowerPoint presentations. This allows parents to fully engage and listen, rather than focusing on taking notes. The sections might include website URLs, class expectations, supplies needed, teacher contact information, and a description of how parents can sign up to volunteer or donate on SignUp.com. 8. Offer flexbilitly. Most Back-to-School nights are very tightly scheduled, but it’s always a good idea to offer a few light refreshments, especially for those parents coming directly from work. If possible, set aside 15 - 20 minutes at the beginning of the event for parents to gather, socialize, and grab a quick bite to eat. 9. Have a system in place to allow your parent/teacher organization collect membership dues on site at Back to School Night. This allows the PTO to hold a membership drive while excitement about the school is running high, and gives them some sense of their numbers for the coming year. A great Back to School Night sets the tone for the coming school year - have fun!